Today's post is about an increasingly common labeling trick that makes food look like it contains less sugar than it really does. Everybody knows that if you want to see what's in the food you buy in the grocery store, all you have to do is check the ingredients list. All foods are required to list all their ingredients, ranked by prevalence, somewhere on the label. 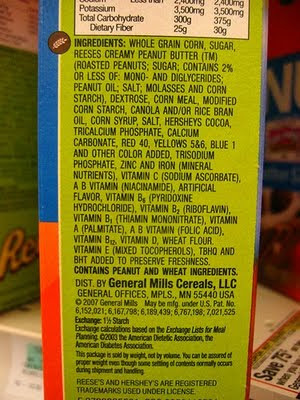 Therefore, if you want to get a rough sense of how much high fructose corn syrup is in your breakfast cereal, or how much sugar is in your pasta sauce, all you have to do is glance at the ingredients. If sugar or HFCS is one of the top three or four ingredients on the list, then you can safely roll your eyes and put the product back on the shelf. It's an easy decision-making method for consumers who don't want to eat over-sweetened food. Unfortunately, a quick glance just isn't enough any more, because many food companies have caught on to us. They know that we've all trained ourselves to scan the ingredients and make sure sugar and high fructose corn syrup aren't near the top of the list. So they've arrived at an insidious workaround that subverts our quick glances, and often leads consumers to underestimate the sugar content of a food. How? By using three, four or even five different kinds of sugar in the food, and listing each sweetener separately. Thus a sugar-heavy cereal that years ago might have listed sugar as the second ingredient may now be made with sugar, brown sugar, molasses, dextrose and corn syrup solids. And those ingredients may be listed as the sixth, seventh, ninth, tenth and twelfth ingredients, respectively. Here's the insidious part: the sugar/sweetener content is higher than ever, but sugar now appears sixth instead of second on the list. And the consumer, who quickly glanced and didn't see sugar among the top three ingredients, is misled into thinking that this food has less sugar than it really does. 1) First, you'll have to read ingredients lists a lot more closely than you did in the past. There's just no way around it. 3) Third, be aware that when you're looking at a list of ingredients with multiple sweetening agents, there simply isn't enough information for you to estimate the total sugar content of that food. However, a good rule of thumb is to assume that any food with three or more sweetening agents has an inappropriately high sugar content. Finally, let the consumer products companies know that you won't use your wallet to support hyper-sweetened foods or misleading ingredient labeling. Of course it's one thing if you're buying cookies or candy--you'd expect to see sugar and its variants prominently (and repeatedly) listed in the ingredients. But if you see this labeling technique used with cereal, pasta sauce, prepared dinners or any other food that really shouldn't contain tooth-aching quantities of sugar, punish that brand immediately. Put the product back on the shelf, shake your head at the shortsightedness of the processed food industry, and slowly walk away. This post owes a debt of gratitude to David Kessler's The End of Overeating, which got me started thinking about this issue. It's all marketing, isn't it? I tend to avoid anything that has HFCS. (Unless I'm in a food-challenged situation like the airport). My other strategy is to check the grams of sugar in a serving, *and* the serving size. Wow, thanks for this incredibly helpful info. I guess what I take away is anything that has ingredients probably isn't worth buying! Thank you for this article. I recently noticed this practice and it makes me angry! Oh yeah. Sweeteners are everywhere. Check out the nutrition label and see how many grams of sugar there are per serving, and pay attention to the SERVING SIZE. Some are laughably small. I read Michael Pollan's latest book IN DEFENSE OF FOOD. I love his guideline, "eat food, not too much, mostly plants." Words to eat and live by. I have a corn allergy, so almost all packaged foods are out of my life. I lost several pounds without trying as soon as I made the switch. I started making soap as a hobby a couple of years ago and was pretty turned off when I started picking up what a lot of food labeling terms really meant - mostly those terms related to oils, preservatives, binders, emulsifiers, colors, etc. I used these same things to make soap and wasn't sure how I felt about eating them. This article is a very handy guide for picking up on the other terms for sugars. Julia, I avoid HFCS too, but unfortunately, that's only one sweetener among many that are worth avoiding. Morta Di Fame, happy to help and glad you got value out of this post. Cynthia: Don't get angry, get even. Adjust your buying habits to punish the companies that you see doing this. Fiona, thanks for your comment. Agreed, the serving size is yet another variable that can be manipulated to make food appear healthier than it is. Holly: Your soap analogy is a powerful one, I really like it. And yes, once you learn the purpose of many of these chemicals (in many instances merely to prolong shelf life), it can make you swear off any packaged foods. Very helpful. I read labels and became so frustrated with the amount of sugar in breakfast cereals I now make my own granola. Haven't bought a box of cereal in ages. I'm slowly buying less and less pre-packaged foods. It takes a bit more time, but I notice a real difference in taste. Once your palate adjusts you won't be able to return to the sugary pre-made foods again. Wow, an excellent post. I'm printing this out for my family and will make sure everybody gets a copy and reads it. Thank you for your post. This practice is so infuriating. I noticed with MSG as well. I was examining a Campbell's Soup Can (don't worry, I was NOT going to eat it) and was surprised (and suspicious) not to see any MSG there. A little investigation....they separated the different components of MSG and listed them separately. It is still in there, but harder to identify. Buyer beware. Declaring individual sugars by common name is not a new practice (at least not new to me). There is nothing in labelling regulations that states all ingredients of one class (such as sugar) must be declared together - never has been. And as a long time consumer (I'm 57), I can say that I rarely fed my son commercial cereals because of added sugars (he's a 35 yr old father now) - much better to add your own sweetener of choice). Also you have always needed to read the full dec - Shortcuts are handy sometimes but usually less accurate. So I disagree that sugar is being hidden in plain view. As consumers we need to take all presented information and use it - mentally estimate all the sugar sources for example instead of relying on a shortcut guidance that is more often than not inaccurate. (Yes as mentioned above - look at the facts panel - one thing it provides is total sugar and the serving size. Takes a little mental math - but well worth it in the long run. Thanks Paulette for an insightful comment that essentially summarizes everything CK stands for: understanding the facts, using them, and making a decision in our interests as consumers--and not shaking our fists powerlessly at the food industry. We are the ones with the wallets and we decide with our buying which products are successful. Thanks for your thoughts.